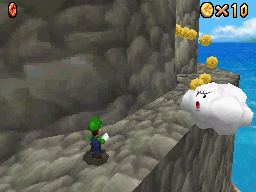 A Fwoosh is a cloud enemy that first appeared in Super Mario 64. It attacks by blowing strong gusts of wind in order to push characters off high altitudes. A Fwoosh in the original Super Mario 64, preparing to blow Mario from the mountain top. In Super Mario 64 and Super Mario 64 DS, a single Fwoosh will blow Mario and his cap off Tall, Tall Mountain. Mario can't defeat it but Wario can walk right past it with his metal ability. The mountain wall after it is a portal to a secret slide. Yoshi also has the ability to eat it and defeat it by spewing fire at it. A Fwoosh makes a very small cameo in Mario & Luigi: Partners in Time. The Fwoosh appears to blow away the smoke from Thwomp Volcano after the mountain's eruption is put out by the Hydrogush 4000. Fwoosh has also made appearances in the Mario Party series. In Mario Party, the player can warp from world to world by hopping on one in Mini-Game Island. Fwoosh can also bring the player back to the start in Mario's Rainbow Castle. In Mario Party 3, the player automatically jumps on a Fwoosh when jumping at the last block of Awful Tower, and the players ride Fwoosh during the introduction and conclusion of Parasol Plummet. A Fwoosh cameos in Mario Golf: World Tour on the strong wind notification, blowing away some Fly Guys. 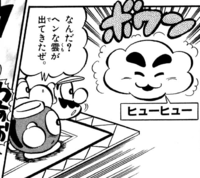 A Fwoosh appears while Mario, Yoshi, and the Bob-omb Buddy ride on a magic carpet in Rainbow Ride in volume 16 of the Super Mario-Kun. It blows Mario's hat away, where it lands on a Big Boo. In Super Mario 64 DS, Fwooshes' face bears a small resemblance to Balloon Boo's. A similar enemy called a Foo appears in New Super Mario Bros. Wii and New Super Mario Bros. U, but Foos only blow clouds so Mario cannot see where he's going, not to blow him away. This page was last edited on April 9, 2019, at 20:23.